As New Jerseyans, it was long overdue for my dogs to experience the beach. 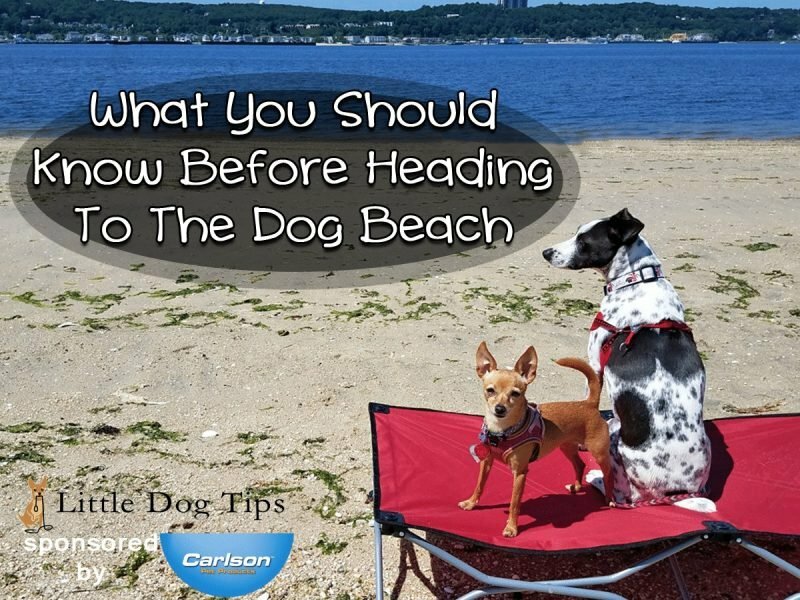 While they aren’t allowed at classic hotspots like Seaside Heights and Point Pleasant, I found the perfect spot for them to soak up the sun and play in the sand – the bay side of Sandy Hook. Our first trip was a huge success! 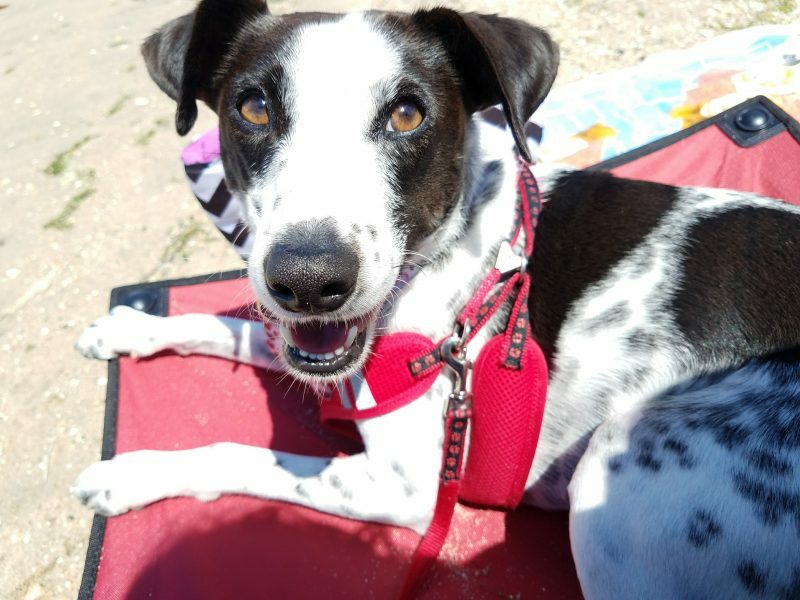 Use our tips to have a fun time with your dogs at a dog-friendly beach near you. This post is sponsored by Carlson Pet. I was compensated and received the pictured cot in exchange for a feature – though I only collaborate with brands that I love and recommend! Thanks for your support. When planning our first ever dog beach trip, I never would have thought to have something like the Portable Dog Cot we got from the folks over at Carlson Pet. But I’m so glad we had it. In preparation for our trip, I opened the cot in my living room and encouraged the dogs to lounge on it. I placed it near the window so they could enjoy a higher point of view when they looked out. Not only did they get used to it, they infused it with their scent so, if they somehow got lost at the beach, they could follow the familiar scent back to their seat. Cow loved hanging out on the cot because it smelled like home. The cot stayed cool and comfortable in the heat, and didn’t get covered in sand like a towel would. Though it supports up to 95 pounds, I was able to sit on it with my dogs. I know it’s not designed for humans, but it supported all three of us without buckling at all. I also love how I hosed it off when I got home, and it was clean. But maybe my favorite thing about it is how it weighs just 4 pounds. 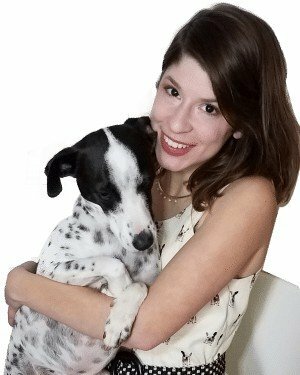 As a newly single dog mom, I was worried about every aspect of this trip – wrangling two excited dogs, keeping an eye on them, carrying stuff onto the beach – but I handled it all without a fuss. The Portable Dog Cot is designed to support up to 95 pounds – ours supported a trio of about 130 pounds of dog/woman. Don’t let the beach bugs bite. 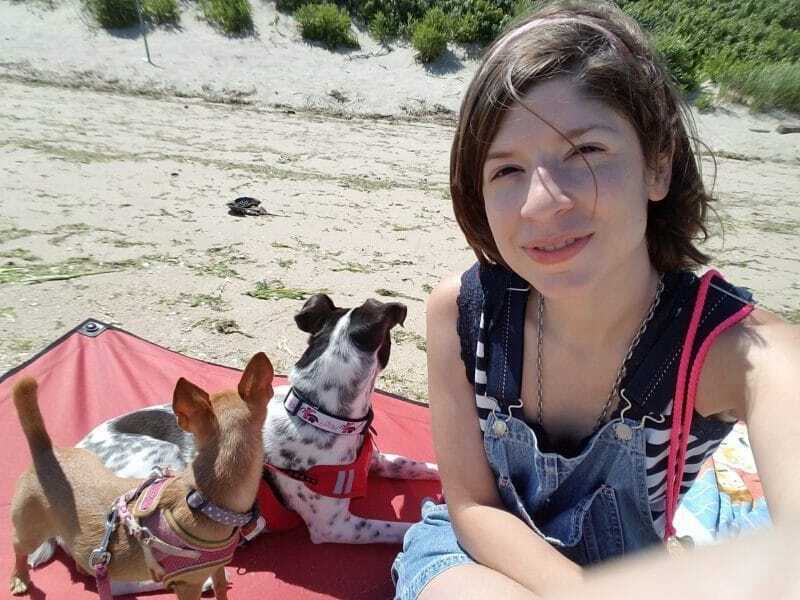 Many people who go to Sandy Hook’s bay area dog beach say they find ticks on their dogs when they get home, but we didn’t encounter any. Make sure your dogs are on a monthly flea and tick preventative, wearing an essential oil based spray, or wearing a flea/tick collar. Also, avoid long grasses and brush whenever possible. Check paws, base of tail, belly, neck and ears before hopping back into the car. 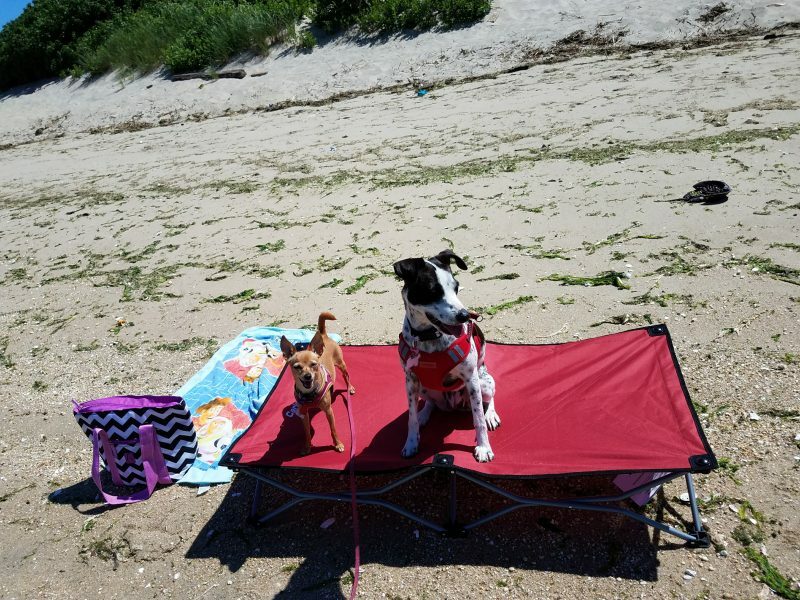 The portable cot was the perfect spot for my dogs to rest between runs, lifted away from bugs and sand on the ground. I forgot to bring a water bowl for the dogs to the beach. I had to make do with a plastic baggy – fortunately, they were happy to drink from it. Next time, I’ll remember to bring their collapsible travel bowl. Matilda doesn’t mind sipping from the end of my water bottle – it’s a useful little skill if you can teach it – but Cow won’t do that. Cow rarely sips water unless she’s very hot and thirsty. We humans know to drink water before we get thirsty when we’re working out or playing out in the sun, but it’s hard to convince dogs to do the same. You can make water more tempting by mixing it with unseasoned broth, a splash of fruit or veggie juice, or bone broth. You can also hydrate your dogs by offering a fruit or vegetable snack. I shared my apple with the dogs for extra hydration. Apples are 84% water. Other high water content dog snacks include carrots, blueberries, strawberries, cucumber and watermelon. Fruits and veggies have plenty of natural sugar, so don’t let them replace an entire meal. Matilda and Cow rushed back to our home base because it meant we were taking a break for some apples and a sip of water. When I called the dog beach prior to our trip, they told me I needed a six-foot leash for each dog. So, that’s what I brought. But a few minutes after arriving, I noticed that most dogs were off-leash. I also noticed that Cow, accustomed to walking close to me in our old neighborhood since before she was even my dog, wanted to run, and I didn’t. We went on a weekday morning, so there were just five other dogs. After our first walk-around, we had met all of them, and there’s just one way to enter the beach, so it was unlikely that we’d run into any surprise encounters. So, I let Cow off-leash, and I let a less trustworthy Matilda drag her leash. My dogs are not extensively off-leash trained. Their recall is great, but like most dogs, they’ll take a while to come if they’re distracted. Even so, it felt like it was worth the risk. I had a bag of treats with me the entire time, and rewarded my dogs whenever they came when called, or when they checked in with me. I didn’t let them out of my sight. I was impressed with their behavior. While they did stop to play at times, they responded when I whistled or called their names, and walked by their friends without stopping if I asked them to. Every time you let your dogs off-leash in a public space, you are taking a risk. It doesn’t matter what training methods you use. It only takes an instant for a fight to break out, or for your dog to head towards the road. You must decide for yourself if the risk is worth it, and if you can control your dogs. I wouldn’t try this on a busy day, but I’m planning on doing this more often at even earlier hours. Dog-dog interactions are risky and unpredictable. Stay close, watch out for stiff body language, and keep encounters brief. I’m always nervous when a big dog wants to play with Matilda, but she’s a confident girl and they seem to take note. I’m always a few feet away, ready to take action if there’s even a hint of tension. “Check it out!” Matilda points out a horseshoe crab exoskeleton. I simply find interesting items and point at them, and my dogs rush over to have a sniff. 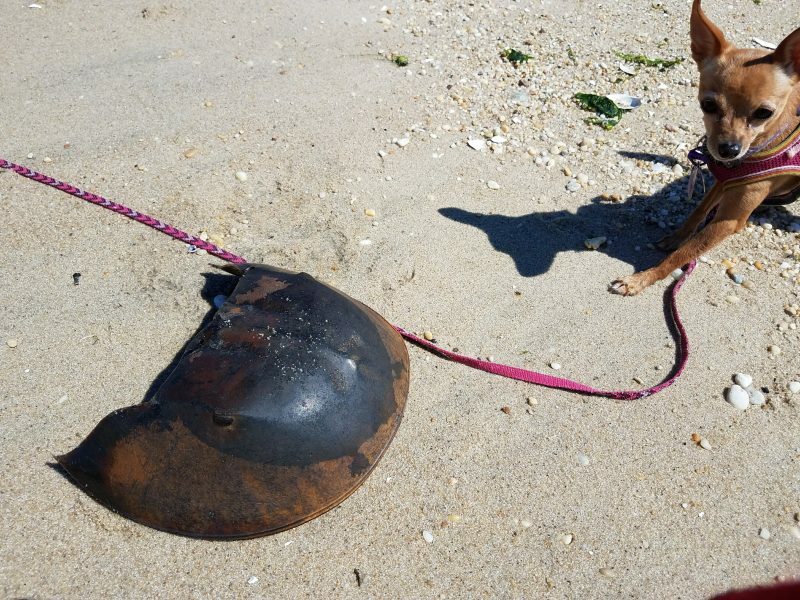 Fish bones, horseshoe crab corpses, clams – check it out! My dogs stayed close to me because I encouraged their need to sniff and explore, and proved to be a worthy adventure partner. I also noticed that if I start digging in the sand, my dogs will start digging too. Next time, I’ll bring a small toy filled with a smelly treat that I could hide in the sand. My dogs aren’t crazy about fetch or chasing toys into the water. They both took a few steps into the calm bay, which was sufficient to keep them cool. 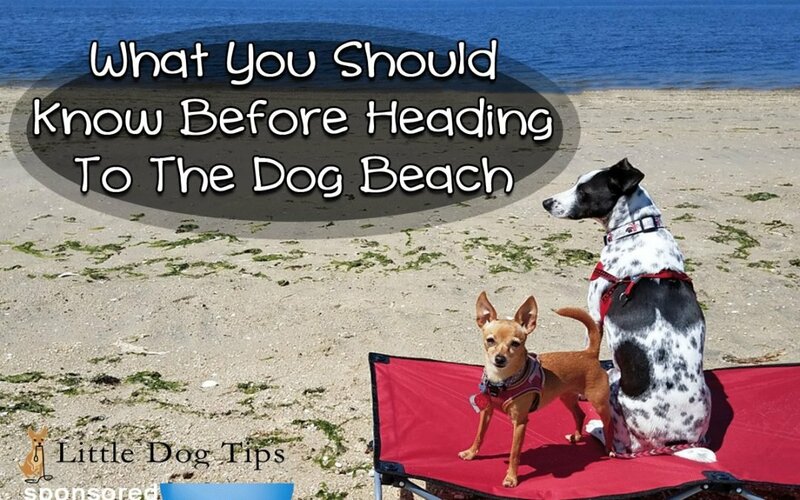 Grab your cot – then head to the dog beach! 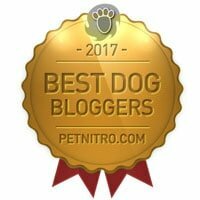 The Large Portable Dog Cot from Carlson Pet was perfect for my small dogs to share, and I can’t imagine going back to the dog beach without it. Get yours from the Carlson Pet online store. Okay, so I’m in heaven that I found your blog. I too own tiny dogs, mini American Eskimo and Shih Tzu mix. I need this cot. I will defiantly be submitting a guest post pitch in the near future. 🙂 Awesome work. Thanks. Your pups sound adorable! I love this cot, such a great idea! Oh My God, this is amazing! This is such a great idea the next time we hit the beach. The cot looks amazing and comfortable for the dog. It gave them a place to lay without getting sand on their bellies, they really seemed to like hopping up on it! can you swim in the water with your dogs if you wanted to? Is it clean? You can, my dogs don’t like to swim, but they did take a dip to stay cool. In Sandy Hook by the bay side, the water is full of seaweed and stuff, but I guess it’s clean enough as far as water goes! Every dog I’ve ever had has loved the beach. We’re living temporarily in Belize right now so Winston gets all his walks along waterfront. But he never gets off-leash (unless he door-dashes) because he’s a terrier and does NOT mind. This cot looks pretty neat. I’m not sure Winston would stay on it, but he might after a few trips. By the way – I used to live right across from Sandy Hook in Highlands. My older daughter was born in Red Bank at Riverview Hospital. Oh my! thank you for sharing this awesome tips!! 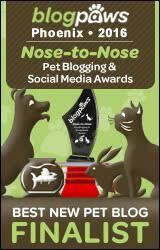 i was reading blogs like this…since i have six dogs with me.. this will help me a lot! cheers!